I began making pots in 1988. After completing a ceramics degree in Bristol, I went on to open Redland Pottery in 1993, a shop/workshop in Redland, Bristol. In 2004, I had the opportunity to live and work on the beautiful Hampton Court Estate in Herefordshire where I stayed for two years. I joined the Herefordshire Guild of Craftsmen around this time and enjoy exibiting with them and other shows and markets. In 2006 I moved a few miles down the road to my new home in the market town of Leominster where I converted the cellar into a workshop and now spend most days making my pots when not out selling my wares at shows. 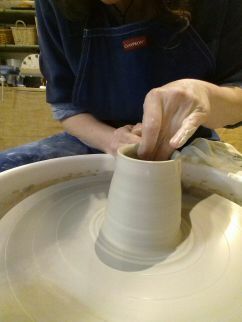 All my pots are wheel thrown using a white earthenware clay. The pots are then decorated using coloured slips and various techniques, including painting, sponging and sgraffito. Once dry and decorated, they are fired to 1000 degrees c and then dipped in a transparent glaze and re-fired to 1110 degrees c.
My aim is to make pots for people to use and enjoy every day. The pots are suitable for the dishwasher but not the oven.